Only users with Administrator privileges can perform these tasks. Administrators perform these tasks through the Eggplant Automation Cloud GUI, which is accessible through a web browser. 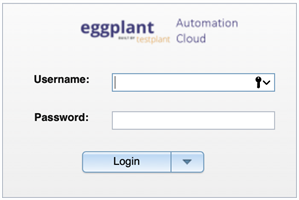 The Eggplant Automation Cloud installation program creates an administrator user you can use to log in to Eggplant Manager the first time. You can continue to use this user by changing its password, or you can create additional administrator users. After you log in, you can change the administrator password on the My Profile page, which you display by selecting Account > Account Settings in the Eggplant Automation Cloud interface. You can also change the default email address for the account on this page. To update the name, username, and email address associated with this primary admin account, you must be using a user with Administrator privileges and navigate to the Available Users page, which you display by selecting Admin > User Administration. Only users with Administrator privileges see the Admin menu. You can also create additional administrator accounts specific to your environment. However, you can't remove the primary admin account. Create new users on the User Administration page. Add, edit, and remove SUTs on the SUTs page. Create and manage user access groups and SUT groups on the Access Groups page. Adjust configuration settings and licensing information on the System Preferences page. Create and manage reservations on the Reservations page. Note: Reservations work the same for administrators as they do for other users. Generate and view reports from the Reporting menu. View the event log on the Events page. Change your password or email address on the My profile page, which is under <Username> > Account Settings.